Lars Lehmann, Managing Director of Carlsberg Malaysia (centre) with the sponsors of CGC 2018 (L-R) Stephan Phuah, General Manager of Fortier Wines & Spirits; Chong Soon Kean, Corporate Marketing Manager of Ogawa; K.P Low, Director of MST Golf representing Cutter & Buck; Eileen Fong, Senior Manager Commercial of TaylorMade Adidas Golf; Tham Onn Chuan, Director of ATG Watch representing Titoni; and Jonathan Ponniah, Managing Editor of ParGolf. 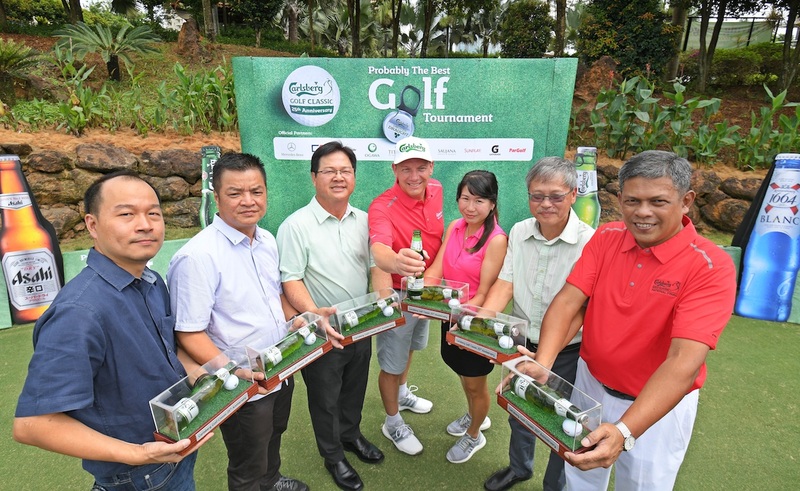 Carlsberg Golf Classic (CGC) will celebrate 25 years as the biggest and longest-running amateur golf series in Malaysia. 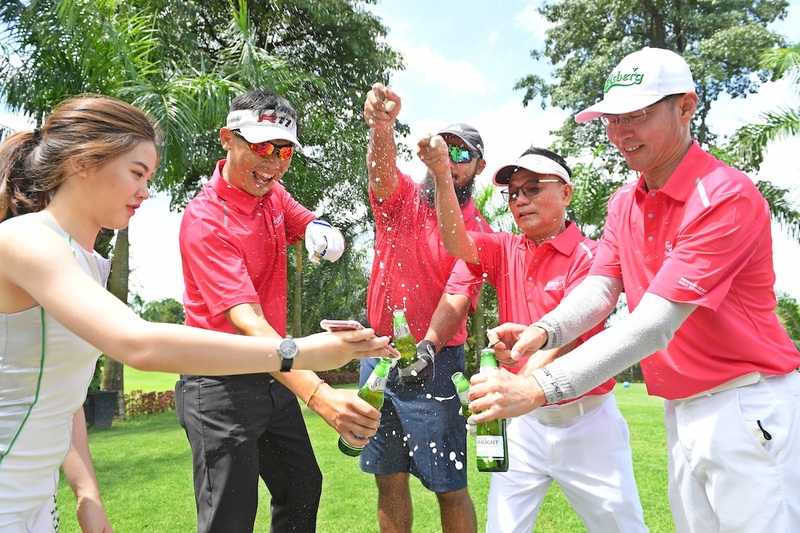 The tournament is offering approximately RM 2.6 million in prizes while promising more fun on the green this year with probably the best sampling of beers and ciders on and off the course. 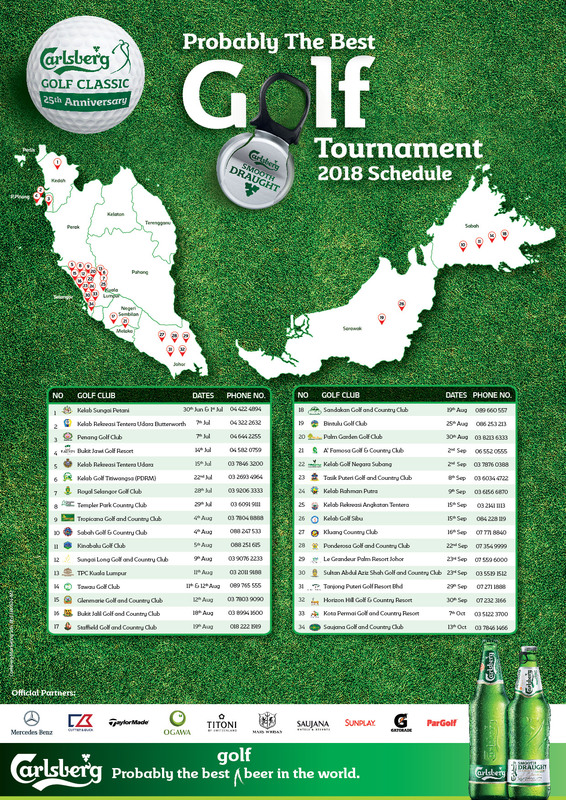 Scheduled to be held at 34 exclusive golf clubs in Peninsular Malaysia (28 legs), Sabah (4 legs) and Sarawak (2 legs) from 1 July to 13 October, CGC is expected to see more than 3,200 amateur golfers competing towards the championship title to be clinched during the national finals at the Palm Garden Golf Club at IOI Resort, Putrajaya on 25 October. The 25thedition of CGC will also feature the biggest hole-in-one prizes including Mercedes Benz E-class & C-class luxury sedans, offered alongside lucky draw prizes and in novelty prizes. 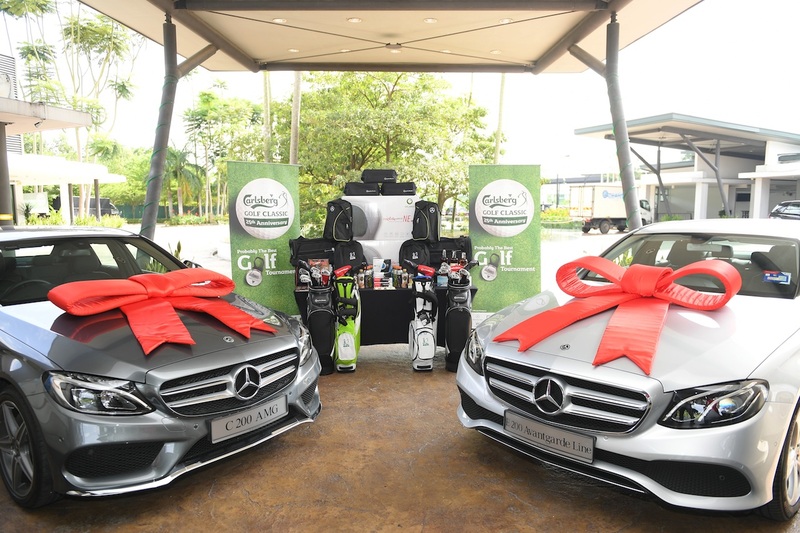 Approximately RM 2.6 million in prizes are up for grabs for CGC 2018 including lucky draws, novelty prizes, and the biggest hole-in-one prizes to date of Mercedes Benz E-class & C-class luxury sedans. “Twenty-five years is a significant milestone as it represents CGC’s unwavering support towards the game and the golf community. Proud to be Probably The Best Golf Tournament in the eyes of many golf enthusiasts, we’ve raised the bar this year with amazing prizes, fun activities with novelty shots on the green and our great brands as we’re bringing Carlsberg Smooth Draught and Somersby cider to the fairway,” said Lars Lehmann, Managing Director of Carlsberg Malaysia at the media launch at Palm Garden Golf Club. “This year, the tournament will be nothing short of fun. Now, golfers can ‘POP’ a draught anywhere, when they are served ice-cold Carlsberg Smooth Draught with the easy-to-open ‘POP Cap’ on the green itself. 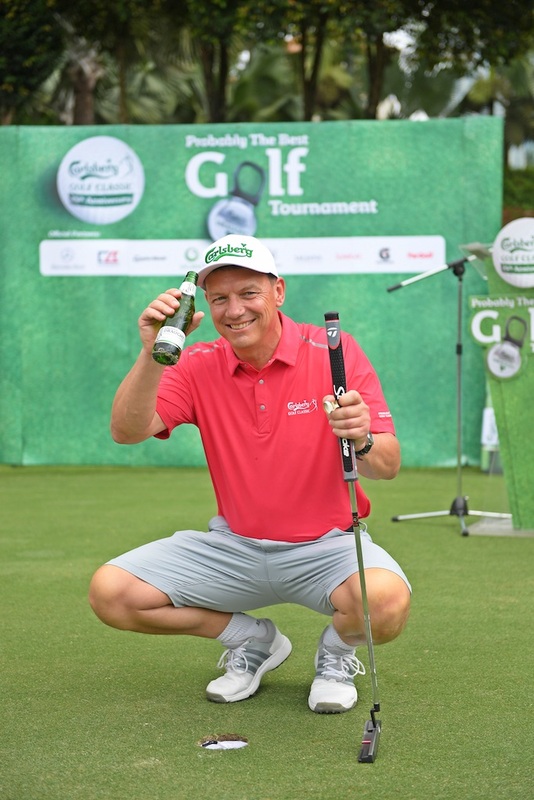 Besides showing off their best golf swing, we challenge them and their flight mates to have the loudest ‘pop’ when they pull open a Carlsberg Smooth Draught to win more of Probably The Smoothest Beer In the World,” Lehmann shared. “If you prefer a fruity thirst-quencher, do look out for the Somersby Kombi mobile pop-up bar for free samples of Somersby cider, available in Apple, Blackberry and Sparkling Rosé flavours,” he added. CGC participants can ‘POP’ a Carlsberg Smooth Draught on the green itself with the easy-to-open ‘POP Cap’ and challenge each other with the loudest ‘pop’ to win more Carlsberg Smooth Draught beer to bring home. Nett and gross winners across the 34 qualifying legs will go home with attractive prizes including premium timepieces from Titoni, Ogawa massage cushions, TaylorMade drivers, putters and golf bags, as well as VIP passes to Probably The Best Brewery Tour at Carlsberg Malaysia’s Shah Alam brewery worth RM100 each. To celebrate CGC’s 25th anniversary, Carlsberg is giving away a limited edition Carlsberg golf cap for every purchase of two buckets of Carlsberg Smooth Draught at participating golf clubs nationwide. The Carlsberg Golf Classic is the biggest and longest-running amateur golf tournament in Malaysia. Golfers can also stand to win Titoni timepieces, cartons of Carlsberg Smooth Draught and passes to visit Probably The Best Lounge simply by snapping their most creative picture with Carlsberg or Carlsberg Smooth Draught products at any golf clubs and uploading it to Facebook or Instagram with the hashtags #carlsberggolfclassic and #probablythebest. 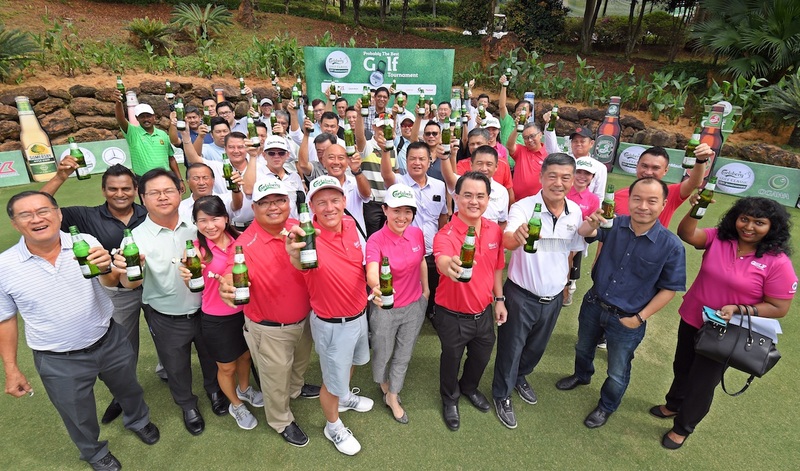 The official partners of the Carlsberg Golf Classic 2018 are Mercedes Benz, Cutter & Buck, TaylorMade, Ogawa, Titoni, Mars Whisky, Saujana Hotels & Resorts, Sunplay, Gatorade, and ParGolf.